Recently, I was asked to list my TOP TWENTY—verses, that is. I am sure you have had a similar request in a Bible Study Group, Sunday School class, or even from a curious friend. Before printing my list, I scrolled through it briefly, looking for typos. Instead of typing John 3:16, I had written 1 John 3:16, instead. I started to make the correction, but I was curious. (I’m always looking for special messages from God. Was this one?) What did the verse in 1 John say? Was there a similarity in meaning to the often-quoted verse, John 3:16? I turned to the reference and read the beautiful words about love. (Also, in John 3:16, so there was a connection, but there was more). The verse was an answer to prayer because I had been searching for the perfect verse to put in my almost-finished Christian Suspense Novel, Truth or Dare—a story about a wayward father called upon to donate a kidney to his child. God heard my prayer for guidance and led me to the exact verse to use in my book. And, yes, 1 John 3:16 will forevermore be included in my Top Twenty. The pastor in the church I attended as a child always ended the Sunday service by proclaiming a benediction. It was my favorite part of the worship hour. I would close my eyes and let the scripture wash over my soul. I felt so close to God! There are many benedictions in the Bible. I’ve included two, here, that are especially meaningful to me. If you have had a hard week…if you are facing difficulties…if you need encouragement, meditate on these words and let the peace of God flood into every corner of your life, bringing you the full knowledge of His love and grace. “Don’t let him fool you. I can read him like a book,” my husband said of our son when he was only ten years old. He was sure that he could tell what our son was thinking—what he was up to—by the look in his eyes and the evasive way he answered him. Wouldn’t it be a compliment to a Christian to be leading a life so “Christ-like” that others would immediately conclude that he/she was a believer? To be leading a life of truthfulness? Full of forgiveness? Wrapped in love for others? A life of service? I’ve met Christians like that. In word and action, so open and gentle in their manner that there is no doubt as to the authenticity of their faith. It is my hope, in 2019, that I would become more and more like Christ. That others would see Christ living in me. That I might be an open book, easily “read” and recognized by everyone as a child of the Most High God. I have a new logo—a heart, with the words, “Stories of Forgiveness” inside. Each of my three Christian Suspense Fiction books has been about something different: abuse, unbelief/pride of self, and bullying. However, the central characters all experience healing because they learn to FORGIVE. Forgiveness has the power to transform lives. No matter who we are or what our background may be, we can each find joy, power, and freedom in forgiveness. But what about love (you know, the heart in the logo) how does that tie in? Some people are not so lovable. People who hate, curse, and persecute you are especially hard to be nice to. However, God says we are to do more than that—we are told to love them. Many years ago, my pastor told me that praying for someone that had “rubbed me the wrong way” would allow The Holy Spirit to work in my heart and make it possible for me to actually come to love that person. So, I put Matthew 5:44 to the test. Over the period of a year (it is not a one-prayer process) I found that I actually came to understand and care for the other person. A young man, appearing to be in his early twenties, sat on a wooden crate on a street corner in Bellingham. He strummed his guitar and crooned a song about love. The point of the song was that one could not completely love another, unless he first learned to love himself. A handful of young people clapped to the beat, nodding to each other in agreement. I’d heard the song before. In fact, there have been quite a number written which echo that same theme. I shook my head as I continued to walk down the street. When I was a child, I learned the song, “J.O.Y.” in Sunday School. It’s a simple song with an enduring message: true joy can only be found when we live by the biblical principal of putting Jesus, first. That is followed by loving others; and finally by putting ourselves last. In the world we live in today, this world of I Phones and I Pads—this life filled with television commercials enticing us to buy whatever looks good to our eyes—it’s hard for us to comprehend that true joy and peace are only achieved by acting in a way which is contrary to our love of self. Yesterday, you were on top of the world. Today, everything has come crashing down all around you. Yesterday, you had no worries…only endless possibilities. Today, you are considering only a few options. Yesterday, the sun was shining and there wasn’t a cloud in sight. Today, the skies are are overcast and there is a storm brewing. Yesterday, you wore a smile that lit up the room. Today, that smile has turned to tears. You are wondering what good can come of your situation…your loss of a loved one…your diagnosis…your sudden disappointing news. You’re holding back the tears, denying the feelings of abandonment, loneliness, betrayal. God wants to rescue you. Pray fervently for Him to heal your relationship, your broken heart, your body. He wants you to draw close to Him. He wants to offer you His strength, His peace, His power. He loves you. Lean on Him. Instead of focusing on whatever your problem is, He wants you to give it over to Him and let Him handle it. He wants you to trust Him and the power of His mighty hand. You are precious to Him. He wants to pour out His love on you. He wants to cover you with His wings. How Will They Know We Are Christians? A horseshoe, a four-lear clover, and a wishbone. Each symbolizes good luck. Manufacturers have unique symbols for their products, whether they be cars, shoes, clothing, or eyeglasses. Sports teams and schools choose mascots to make themselves more recognizable to the public and to build team/school spirit. Traffic signs utilize symbols to help drivers become instantly aware of the rules of the road, especially those involving emergencies/warnings. 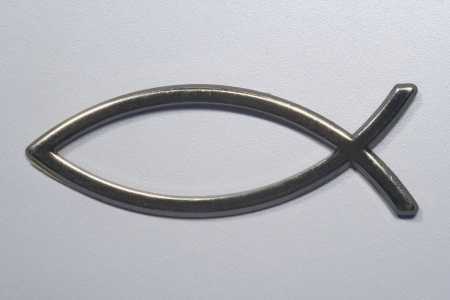 One interesting symbol Christians sometimes use is that of the fish, often seen on fenders, jewelry, and stationary. The use of the fish symbol by Christians began in the early days of Christianity. Since Christians were often put to death for practicing their faith, they often worshiped in secret places. A fish painted on the outside door of a house let Christians know that they would be safe and welcome inside. It was also used as a Christian greeting. Upon meeting someone new, a believer would draw half of the fish symbol in the dirt and the other person (if a Christian) would complete the other half of the symbol, thus revealing himself or herself as a Christian. However, if the other person did not recognize what was being drawn, he was most likely a non-believer. Thus, the believers’s religious beliefs remained hidden. Today, the Christian fish symbol is often used to identify Christians and/or Christian businesses. Free from persecution, at least here in the United States, the fish symbol is proudly displayed for all to see. Jesus tells us that it is not symbols, elaborate robes, or showy prayers that should identify Christians to the world. He wants us to show love and understanding to each other… to grant others the same mercy and grace he extended to us. 2 John 1:3– Grace, mercy, and peace will be with you from God the Father and from the Lord Jesus Christ, the Son of the Father, in truth and love. Ah, love. It’s a great feeling, isn’t it? But, although loving another person prompts us to show our love for them through our actions, our behavior toward those we don’t love isn’t motivated in the same way—if at all. Wouldn’t it be wonderful if we felt such love for everyone that we showed it in our actions toward all people… at all times? That’s not possible, you say. Left to our own devices…acting according to our own nature…we simply are not capable of experiencing—and acting in accordance—with that kind of all-encompassing love. His very essence is love. One hundred percent of Him. One hundred percent of the time. Essence: the intrinsic nature or indispensable quality of something that determines its character… without which it would not exist or be what it is. So, following the definition, God’s very nature is love and without it, He would not exist. He is completely love…all of Him. He’s not just loving in his actions to some people at some times (when He feels like it). He’s not just motivated by it, as human beings are. Only love can love…everyone…all the time. It’s impossible to wrap our heads around that truth, isn’t it? And, because He acts in accordance with his very essence, he cannot act in opposition to it. He loves unconditionally because the pure essence of His love doesn’t depend on you and I—or our actions—at all. Because that’s how He is. God Sent You a Valentine! 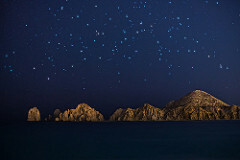 In the very stars of heaven, God proclaims his great love for us. God sent us a Valentine!! His love knows no bounds. His message is written in His Word and in the heavenly bodies of the universe. That’s right! They aren’t just beautiful creations of light hung there for our enjoyment. (Although that was certainly part of His intent). They were, in fact, put there to tell God’s story of His love, and plan of redemption. Quite some time ago, my mother-in-law gave me the most fascinating book by the late James Kennedy called, The Real Meaning of the Zodiac. It contains his well-documented research, as well as that of eight other well-known Bible scholars. It is an astounding account of God’s love. The book was printed as a special TBN Edition in 1989 and one of their most requested publications ever. In it, Dr. Kennedy unfolds the timeless story of God’s love—His Gospel in the stars. His marvelous masterpiece, the art gallery of God, depicts the message of redemption revealing to man the account of the coming, suffering, death, and resurrection of Jesus Christ. That’s right. The way of salvation is revealed beautifully for us in the heavens! Dr. Kennedy begins the explanation of the true Zodiac with Virgo, or the Virgin and the birth of the incarnate Son of God. He continues the “great celestial preaching of the Gospel” with the other eleven signs, ending with Leo, The Lion, which depicts Christ’s victory over sin, the world, and Satan. By citing specific scripture for each sign, Dr. Kennedy reminds us that God has done all of this so that we might know of God’s love…that we might know His son as our savior, and so that the glory of Jesus and his redemption might fill our hearts with wonder and praise. He loves me. He loves you. He has told us so in His Word, in the heavens, and by sending us the gift of salvation through his son, Jesus. May you never look at the night sky in quite the same way again. It is His Valentine to mankind.